This is a new-to-me read. 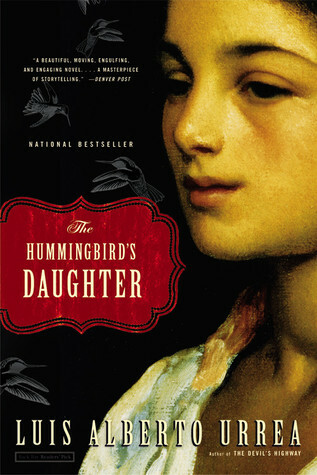 Written by Luis Alberto Urrea over the course of 20 years (finally published in 2005) The Hummingbird’s Daughter follows Teresita, a young girl in 1890s Mexico, who eventually develops into a full fledged miracle worker – The Saint of Cabora. Based on the true story of Urrea’s family! We read this for my around-the-world book club and the discussion was brilliant. This novel has everything: rich culture, well rounded characters, love, revolution, a touch of magic and a heap of passion. The language is beautiful – every word is a new color in this image of Mexico Urrea has painted. Teresita is surrounded by a cast of characters each as real as the next. Although Teresita is a peasant (the illegitimate daughter of Don Tomas, head of the estate) Tomas is taken by her audacity at a young age and allows her to live in the house, doting on her and encouraging her education. Huila, the curandera, teaches Teresita to recognize plants and assist in healing while a friend of Tomas teaches her to read and write. In the meantime, revolution is brewing in Mexico. Bandits rule the open roads and the army is quick to pounce on anyone suspected of stirring the pot. The Hummingbird’s Daughter is a masterpiece. Absolutely stunning!